62445301681 ../;jsessionid=101791lwlj55a5ulh71djxbez8ots91.10179?wicket:interface=:0:beta-club:modal-container:modal-content:content:body:login-rixty-form:visibilityContainer:fbconnect::IActivePageBehaviorListener:1:1&wicket:ignoreIfNotActive=true It seems like your browser is preventing Facebook Authentication. This happens when your browser's Tracking Protection is enabled. To continue logging in via Facebook, please turn off Tracking Protection or use a different browser. 62445301681 ../;jsessionid=101791lwlj55a5ulh71djxbez8ots91.10179?wicket:interface=:0:login-panel-small:login-small:login:modal-container:modal-content:content:body:login-rixty-form:visibilityContainer:fbconnect::IActivePageBehaviorListener:1:1&wicket:ignoreIfNotActive=true It seems like your browser is preventing Facebook Authentication. This happens when your browser's Tracking Protection is enabled. To continue logging in via Facebook, please turn off Tracking Protection or use a different browser. 62445301681 ../;jsessionid=101791lwlj55a5ulh71djxbez8ots91.10179?wicket:interface=:0:login-panel-small:login-small:signup:modal-container:modal-content:content:signup-form:fbconnect::IActivePageBehaviorListener:1:1&wicket:ignoreIfNotActive=true It seems like your browser is preventing Facebook Authentication. This happens when your browser's Tracking Protection is enabled. To continue logging in via Facebook, please turn off Tracking Protection or use a different browser. 62445301681 ../;jsessionid=101791lwlj55a5ulh71djxbez8ots91.10179?wicket:interface=:0:redeemcode:modal-container:modal-content:content:body:login-rixty-form:visibilityContainer:fbconnect::IActivePageBehaviorListener:1:1&wicket:ignoreIfNotActive=true It seems like your browser is preventing Facebook Authentication. This happens when your browser's Tracking Protection is enabled. To continue logging in via Facebook, please turn off Tracking Protection or use a different browser. SafetyPay is a real-time global payment solution that enables customers to securely make online purchases at Rixty and pay directly through their local bank account in the currency of choice. 1. Inside your favorite game or website, begin the checkout process and select Rixty. Select 'Bank Transfer' from the Rixty payment options and confirm the amount. A SafetyPay window will open. 2. Confirm your bank and the purchase amount of your purchase. 3. Login to your online bank account and confirm your transactions. 4. 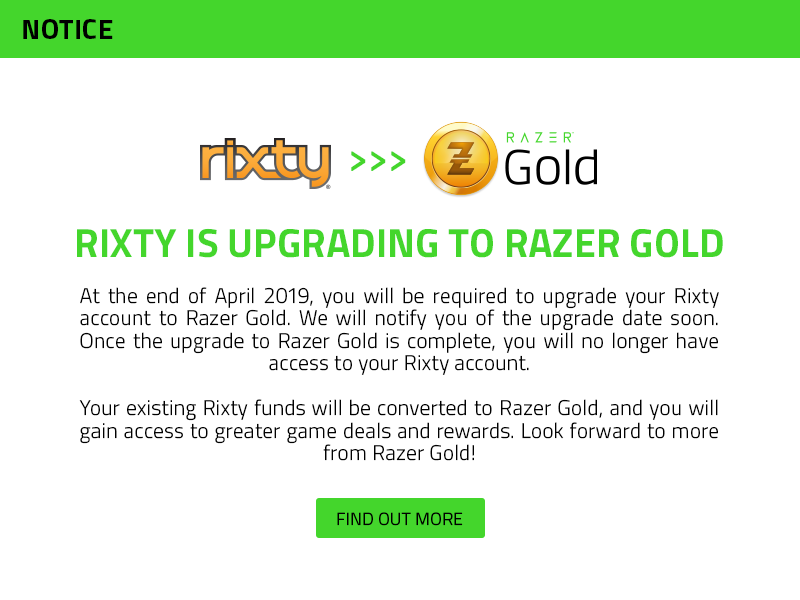 When Rixty receives payment, you will receive an email with the confirmation details of your game purchase. 1. Inside your favorite game or website, begin the checkout process and then select Rixty. Select 'Cash' or 'SafetyPay' from the Rixty payment options and confirm the amount. You will be given a unique transaction number to print or email. 2. Take your transaction number to a participating bank and pay in cash. 3. When Rixty receives payment, you will receive an email with the confirmation details of your game purchase. Hours: Online 24x7x365. Cash transfers vary by bank. Complete online bank transfers in Canada, Colombia, Costa Rica, Mexico, Nicaragua, Panama and Peru, or pay with cash at participating banks in Colombia, Mexico, Nicaragua, Panama and Peru. CLICK HERE for an updated list of participating banks.